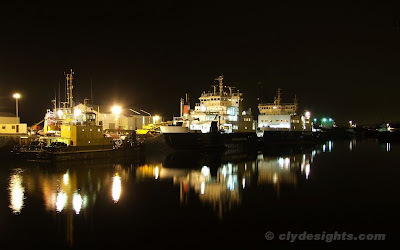 An unusual occurrence took place on Wednesday evening, when two of CalMac's Rothesay ferries were berthed together in the James Watt Dock. BUTE was nearing the end of her annual survey, while CORUISK had been relieving first ARGYLE and then BUTE in turn, on the service from Wemyss Bay to Rothesay. To allow BUTE to return to service, CORUISK had to act as a donor for some equipment - this was duly transferred overnight to permit the newer ship to resume her own duties on Thursday morning. Also berthed at the Garvel yard was SD-MOORHEN, a service vessel more usually found at Kyle of Lochalsh. Well worth the small diversion ! !